Chines smartphone giant Xioami has tweeted that “i IS COMING, is coming to India on 23rd April. 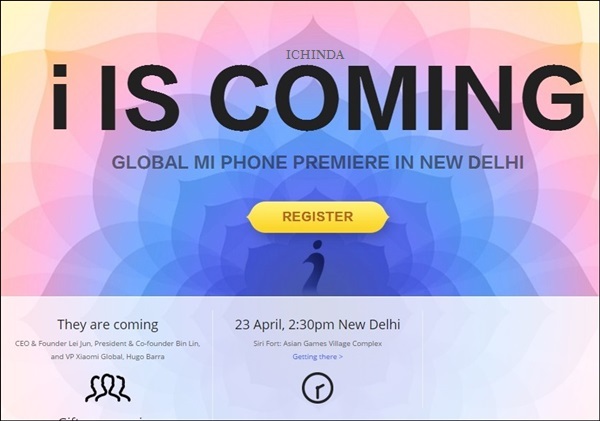 Xiaomi is taking registration for ” Global Mi phone premiere” through Xiaomi Indian website which going to be held on 23rd April, 2.30PM, New Delhi. Xiaomi is going to launch three mid-range smartphone and a budget smartphone in this event which includes all new Xiaomi Mi Note, Xiaomi Mi Note Pro, Xiaomi Mi5 and Xiaomi Redmi 2A. Xiaomi Mi Note, Xiaomi Mi Note Pro, Xiaomi Mi5 will be priced under Rs 20,000 while Xiaomi Redmi 2A world’s cheapest 4G LTE smartphone cost you Approx. Rs 4,999. The all new Xiaomi Mi Note is available in China at CNY 2,299/ $371 (Approx. Rs. 23,000) for the 16GB and CNY 2,799/ $451 (Approx Rs. 27,900) for 32GB from January 27th in China with accidental insurance for 199 Yuan($32). Xiaomi Mi Note features world’s first curved glass body support Dual 4G SIM (micro/nano), Dual Standby, 4GLTE, NFC, Wi-fI, Bluetooth come with a bigger 5.7-inch Full HD 2D glass Sharp JDI display offering a pixel density of 386ppi with resolution(1920×1080) and gorilla glass 3 protection powerful 64-bit 2.5GHz, quad-core Qualcomm Snapdragon 801 processor, Adreno 330 GPU with 3GB RAM offers you superior graphics and gaming experience, boosting 3D interfaces, colors and textures and run on MIUI 6 base on Android 5.0 OS with 16GB and 32GB internal memory variant with 64GB expandable memory offers enough space to store your favorite data sporting a powerful 13-MP rear camera with f/2.2 aperture, Sony CMOS sensors(Sony IMX214 with zero shutter lag), with the OIS and dual tone dual LED flash perfect for low light shooting and 4-MP rear camera with large 2-micron pixels for video calling and selfies powered by a powerful 30,00mAh battery with sophisticated Quick Charge 2.0 technology offers you the longest battery life ever measures 155.10 x 77.60 x 6.95mm and weight just 161gm. The all new Xiaomi Mi Note Pro is available in China from Mrach 2015 at CNY 3299 (approx. Rs. 32,900) with accidental insurance for 199 Yuan($32) which support Single SIM, 4GLTE, NFC, Wi-fI, Bluetooth, LTE Cat. 9 networks with download speeds up to 450Mbps come with a bigger 5.7-inch QHD 2D glass Sharp JDI display with (1440×2560 pixels) resolution offering a pixel density of 515ppi and gorilla glass 3 protection powered by a powerful octa-core 64-bit Qualcomm Snapdragon 810 processor (quad-core ARM Cortex A57 and quad-core Cortex A53) with 4GB of LPDDR4 RAM and Adreno 430 GPU offers you superior graphics and gaming experience, boosting 3D interfaces, colors and textures and run on MIUI 6 base on Android 5.0 OS which allows you to enjoy millions of apps from Google play store. It comes with 64GB internal memory variant with 64GB expandable memory sporting a powerful 13-MP rear camera with f/2.2 aperture, Sony CMOS sensors(Sony IMX214 with zero shutter lag), with the OIS and dual tone dual LED flash perfect for low light shooting and 4-MP rear camera with large 2-micron pixels for video calling and selfies powered by a powerful 30,00mAh battery with sophisticated Quick Charge 2.0 technology offers you the longest battery life ever measures 155.10 x 77.60 x 6.95mm and weight just 161gm. According to rumors, upcoming Xiaomi Mi5 will offer you a full metalick body with Dual-SIM with Dual-Mode(GSM+WCDMA), 4G LTE, 3G, NFC, Wi-Fi, Bluetooth, USB and GPS offers you a 5.7”-inch full-HD LCD display with resolution (1080×1920 pixels) will run on most advance Android Lollipop OS dubbed MIUI version 6 powered by a 64-bit Octa-core processor with 3GB RAM, 16GB internal memory expandable up to 128GB via MicroSD card. Mi5 will sport a huge 20.7-MP rear camera with dual-LED flash with Sony CMOS Sensor and 8-MP front facing camera expected to be packed with a powerful 3500mAh Li-ion battery with battery stamina Mode including innovative features like heart rate monitor and fingerprint sensor. While The all new Xiaomi Redmi 2A launched in China on 31st March at CNY 599 (Approx. Rs. 6,000) is on sale in cheaper price from 8th April 2015 at CNY 499 (Approx. Rs. 5,000) as a part of Xiaomi festival. Xiaomi Redmi 2A supports Dual-SIM(GSM+WCDMA) 4G LTE, 3G, GSM/ EDGE, WCDMA, LTE FDD, and TD-LTE comes with a bigger 4.7”-inch Full HD display with HD 720p resolution , AGC Dragontrail™ scratch-resistant glass runs on Android 4.4 kitkat and 1.5GHz L1860C quad-core processor along with Mali T628MP2 GPU with 1GB RAM, 8GB internal memory expandable up to 32GB via MicroSd card sporting dual camera, a 8-MP rear camera with ƒ/2.2 aperture, 28mm wide angle lens and up to 720p at 120fps and 1080p at 60fps, With an extra large 1.4ųm sensor and a 5 plastic lens, you can take photos with accurate, true-to-life colors in low light while 2- megapixel camera is perfect for HD video chatting at 720p packed with a powerful 2200mAh battery with fast charge technology including Mi Sound Hi-Fi System with Dirac sound technologies measures 134×67.21×9.4mm and weight 132gm which is 26gm. At last few honest word, Xiaomi planning rock and rule the Indian market. What you think? Please be open to give your view.